Through new leadership, a unique fitness program and resurrection of the hale mua concept, the role of Hawaiian kāne is being restored and redefined. According to mythology, Kū, one of the four major males in the Hawaiian pantheon, once lived simply, as a mortal man. When his family experienced a great famine and were on the brink of starvation, the loving father knew drastic measures were necessary to provide food for his keiki and wife, Hina. He stood on his head and sank into the earth. Hina cried for the loss of her husband, and her tears watered the ‘āina where Kū had disappeared. There sprouted the first ‘ulu tree, whose fruit saved Kū’s family and countless others from starvation. The story shows Kū’s sacrifice and strength, truly admirable qualities for a kāne. training session with the pule, “Nā ‘Aumākua,” asking ancestors for strength, guidance and insight. Students may be challenged with self-doubt and frustration, and learn to work through those struggles in body and mind. In closing, they chant “He Mū ‘Oia,” to clear the mind of negativity before the group departs. Photo by Josiah Patterson. All rights reserved. “The ‘Kū body,’ put simply, is strength—when people think about strength and what I do, they think about physical strength,” says Aipa, but he has more than muscles in mind. “The whole ‘Kū body’ is that continuous effort to contributing to yourself and to others and making yourself stronger physically, mentally and spiritually,” he says. As a wrestler in high school, Aipa realized the value of the gym at an early age and weight lifting remains one of his passions. After attending lua masters Billy Richards and Tom Kaulukukui, Jr.’s workshop, Ke Koa Alaka‘i, in 2006, he was able to incorporate Hawaiian cultural philosophy into ho‘oikaika. Within the literal definition of the god’s name, there is a philosophy and lifestyle approach, as kū literally means to “stand upright,” and within this context a kāne can find purpose and inspiration to improve. Aipa is tackling something that has plagued, and continues to challenge, the Native Hawaiian male population: a lack of regular physical exercise and a high incidence of disease. According to “Ka Huaka‘i 2014: Native Hawaiian Educational Assessment,” a report by Kamehameha Schools, startling statistics point to the current negative health trends for kāne. The report looked at data collected from the 2012 U.S. Census, and showed that Native Hawaiian men are the most likely of Hawai‘i’s major ethnic groups to develop diabetes, heart disease and lung cancer. Furthermore, the ratio of cancer mortality among Hawaiian men is approximately 5:10, which means for every two kāne diagnosed with cancer, one dies from malignancy. In contrast, collectively Hawai‘i’s mortality to incidence ratio is 4:10. Kū is, as Aipa points out, much more than a representation of bodily strength. According to anthropologist, scholar and author Ty P. Kāwika Tengan, Ph.D., boys would traditionally learn mo‘olelo about Kū in a place called the hale mua. “The hale mua was the first formal institution that young boys were initiated to and became a part of the men’s eating house,” says Tengan, who is an associate professor at the University of Hawai‘i at Mānoa. In 2008, he published the groundbreaking book, “Native Men Remade: Gender and Nation in Contemporary Hawai‘i.” It documents the journey of several kāne and their rediscovery of their indigenous culture, and covers the Hawaiian Men’s Movements of the 1990s and 2000s, which included groups like Hale Mua, Nā Koa and Pā Lua. Attendees made pāhoa daggers as part of their Kū-inspired activities. The daggers symbolize a man’s responsibility to defend his family, community and resources. Photo by Josiah Patterson. All rights reserved. According to Tengan, before boys entered the men’s eating house they were keiki ma‘i lewalewa (prepubescents who did not wear malo) who dined in the hale ‘aina (women’s eating house) with their mothers, aunties and grandmas. Between the ages of six and eight, the boys would be initiated into the hale mua and given their first malo, which was a symbol of their journey into manhood. This rite of passage was called “kā i mua,” which literally means to “cast into the men’s house” or “thrust forward.” In the hale mua, boys would learn the finer points of fatherhood, husbandry, warrior-hood and life skills, such as farming and fishing. At the same time, ‘ōpio would be educated in society’s protocols and kapu, which put an emphasis on developing moral character and cultivating masculinity. Tengan’s book highlights several events that altered the identity, masculinity and roles of Native Hawaiian men. After the death of his father, Kamehameha I, and under the influence of his mother, Keōpūolani, and Queen Regent Ka‘ahumanu, Kamehameha II abolished the ‘aikapu (the taboo of men and women eating together) in 1819. This was the first act toward the eventual end of the kapu system, which ushered in Christianity and ended the exclusivity and institution of the hale mua. Through the eventual overthrow of the Hawaiian monarchy, colonization by the United States and emasculation of the kāne by the tourism industry, Hawaiian males’ roles and identities have suffered. As a member of the modern Hale Mua o Maui, Tengan explored the emasculation and dislocation of Hawaiian kāne through colonization. The hale mua was traditionally the place where kāne would gain their sense of identity, Tengan writes, strengthening their connection to the ancestors, gods and heritage through cultural practices and interaction with male role models. At a recent gathering at the Queen Lili‘uokalani Children’s Center in Wai‘anae, Keawe‘aimoku Koholokula Ph.D., speaks to men about the attributes and principles of Hawaiian male leadership. Photo by Josiah Patterson. All rights reserved. According to Tengan, the modern hale mua is a part of a broader Hawaiian men’s movement that derived from the nā koa groups, pā lua and ‘aha kāne. He cites Hawaiian community leaders like Sam Ka‘ai, Kyle Nākānelua, Kamana‘opono Crabbe, Keawa‘aimoku Kaholokula, Billy Richards, ‘Umi Kai, Tom Kaulukukui, Jr. and many others as the early groundbreakers of the Hawaiian men’s movement. The modern hale mua was born from the commemoration of Pu‘ukoholā heiau in 1991, and was designed to be a more casual gathering place than a traditional hula hālau. The hale mua incorporated chanting, prayer and dance, yet, was more egalitarian than the Hawaiian dance troupes. 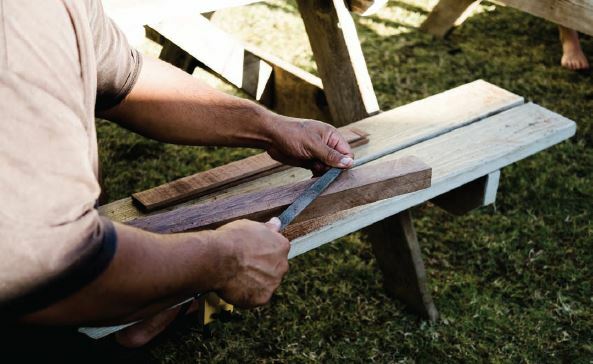 The hale mua is also a place where men can gather for Hawaiian cultural workshops and participate in woodcarving, martial arts, ku‘i ai, chant and prayer. Most importantly, they can develop peer relationships and share life experiences. Daniel Ikaika Ito’s article “Building Up” appears in its entirety, along with 19 other previously published MANA Magazine articles, in the anthology MANA: A Journal of Hawai‘i. Original publication: February/March 2015 issue.